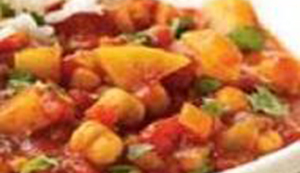 This is a great one pot meal that features chickpeas, common Moroccan spices, potatoes, tomatoes, and onion. In a large sauce pan brown chicken in olive oil over medium heat until almost cooked through. Remove chicken and set aside. Sauté onion, garlic, carrots, celery and sweet potato in same pan using a little broth if necessary. When tender, stir in paprika, cumin, oregano and turmeric. Cook for 1 minute then mix in broth and tomatoes. Add chicken , reduce heat to low and simmer covered for 10 minutes. Add chickpeas and zucchini and simmer for an additional 15 minutes and serve.